The Internet has brought us as many or more resources since the PC. woot for that. All that automation of web applications has made us more efficient. The powers of our new world end in the old world. Bridging the gap between these worlds I think is the next step. Robotics. We have seen ASIMO and QRIO. To me they seem like the mainframe computers of the past. Expensive and the public has no access to them but that is changing fast. I see the near future (if you need a number from me 2014) a movement as great as the Internet, by people adapting their lives around Robotics. Remember that feeling of 1991 and making your first HTML site. Well that is what it’s like with the Arduino today. You can make automated solutions to your daily task. 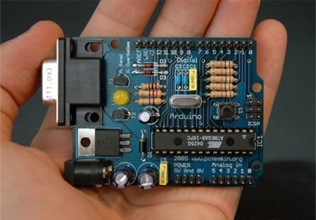 The Arduino community is growing, sharing and self-updating. The community reminds me of SourceForge.net . Mouna, has the automation interaction fever too. Arduino is the key to every teenage nerd fantasy: robot girlfriend. Am I the only one who sees this?